J.U.L.I.E.T's (Just Us Ladies, I Eat Too) is the companion group to the R.O.M.E.O. 's (Retired Old Men Eating Out). The JULIET's is a social group strictly for eating out once a month! No rules, no dues, no obligation! A good-will offering is taken at each outing to be used for a charity to be determined at a later date, but the group is primarily about fellowship! Any woman who is available to go out to lunch on the first Friday of each month is welcome to JULIET's. We choose a different restaurant each month. There is a short devotion at the beginning of each luncheon, led by a member. Otherwise, we minister to each other by providing fellowship, a listening ear, and a ride if needed. 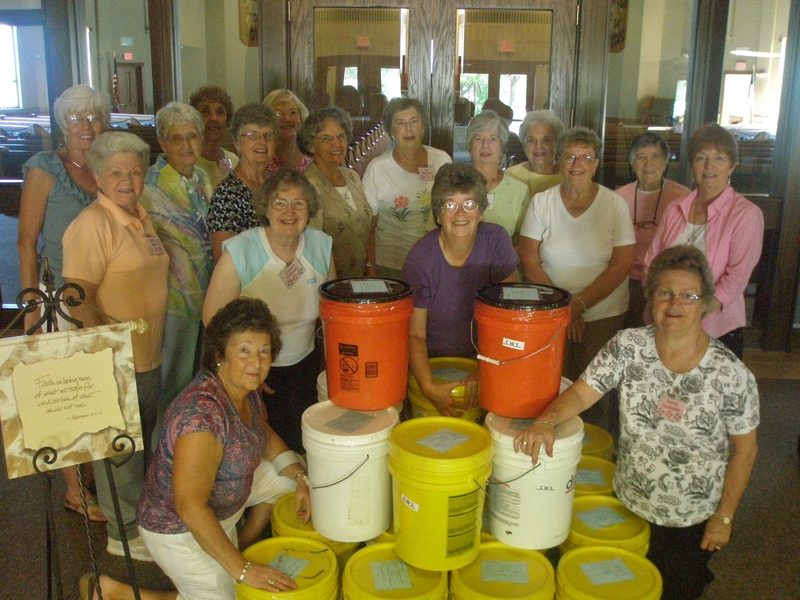 For the past several years, the JULIETS have taken on a community service project to create Emergency Clean Up Buckets for the Church World Service. A multi-denominational group, CWS is one of the first groups on the scene when disaster happens. These supplies enable people to begin the overwhelming job of cleaning up after a flood, hurricane, tornado or other disaster here in the United States. Truckloads of clean-up buckets were delivered to people in Joplin, MO and throughout the Midwest after the spring tornado season. Now the CWS warehouse urgently needs to be restocked to prepare for the upcoming hurricane season.